Legio XVII Series, Book 3 (historical fiction): Following Scipio’s victory at Ilipa, Spain in 206 BC, Mago Barca, Hannibal’s brother, sails with his army to the northern Italian port of Genoa in 205, to attempt to do what his brother Hasdrubal failed to do in 207: reinforce the embattled Hannibal. Mago recruits mercenaries from as far away as Illyria (modern Albania) and Posonium (modern Slovakia). Praetor Manius Tullus leads Legiones XVII and V Etrusci to Verona to prevent the mercenaries from joining Mago and fights them at the Battle of Lake Benacus. Scipio arrives in Africa in 204 BC and fights two decisive battles. Under intense pressure from Carthage, Mago engages the veteran Legionaries blocking his way south. Carthage recalls Hannibal from Italy and sets the stage for the Battle of Zama between the two greatest generals of the 2nd Punic War. A last minute appeal from Scipio draws Manius and his two Legions to Africa to block Numidian cavalry from joining Hannibal. 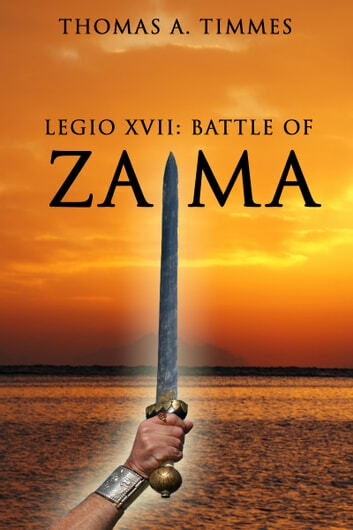 The fictional exploits of Legio XVII are impacted by the Punic War and its military operations are conducted in support of the overall war effort, but do not intrude into or alter actual historical events. Together, the three books present a complete summary of that ancient War. As to be expected the attention to detail and the presentation of transferring the reader to another place and time that felt sereal as if it was happening for real the best read I wait with much anticipated zeal so I once again can be taken that amazing place again. I read all 3 novels and enjoyed them. Thomas Timmes is up with the likes of Cameron, Scarrow and Riches. Keep the novels coming. The book story commenced slowly. Overall book read ok. Certain capters in this book do have spelling mistakes.